Acanto Ceiling Lamp. 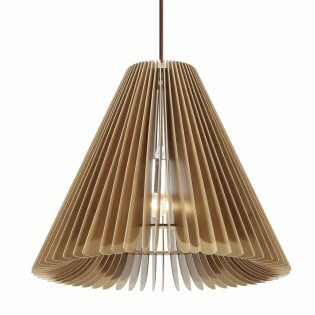 Barcelona Design stylish pendant light, inspired by Nature with lampshade in the shape of a bell. Available in brown and black textile, with a wood ceiling cover. It is proper especially for restaurants and hotels lighting projects. Overall dimensions: Height 183 cm. Lampshade dimensions: Height 63 cm. Diameter 34 cm. Amazon Ceiling Lamp. 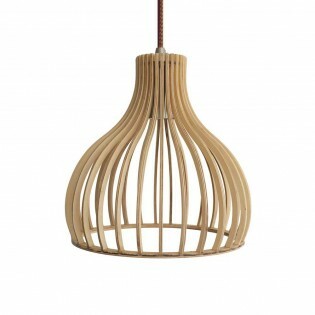 A huge wood lampshade of natural colour, wiht very fine and elegant lines, and a brown textile cable. For eco friendly and lovely interiors. Overall dimensions: Height 160 cm. Lampshade dimensions: Height 40 cm. Diameter 45 cm. 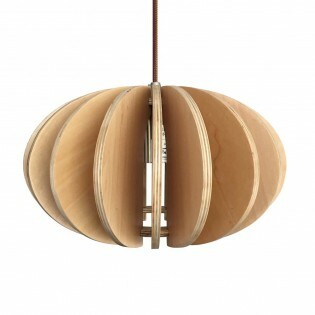 Ceiling lamp with oval lampshade made of wood. The bulb is completely visible and becomes the protagonist of the lamp. Get a cozy and quiet atmosphere in your dining room, kitchen, living room, bedroom.... It will bring a rustic and modern touch. Total dimensions: Height 165 cm. Lampshade dimensions: Height 45 cm. Diameter 50 cm. Canela Ceiling Lamp. 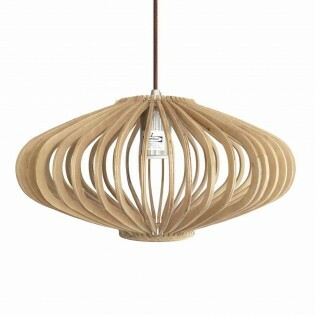 Barcelona Design, inspired by nature pendant light, with a beech wood lampshade, clear cable and wood ceiling cover. For interiors inspired by Nature, in eco friendly style. Overall dimensions: Height 141 cm. Lampshade dimensions: Height 21 cm. Diameter 25 cm. Ceiling lamp Cidro. Hemp making up the lampshade, large diameter, narrower top than bottom with a really nice look, orange inside and black fabric cable. Without a doubt, the natural touch that your dining room or living room needs. Total dimensions: Height 160 cm. Diameter 25 cm. Lampshade dimensions: Height 30 cm. Diameter 25 cm. Coco Pendant Lamp with black cable and hanging pear-shaped lampshade made of ash wood and brown textile to give the natural and differentiating touch. Ideal to illuminate kitchens, living rooms or bedrooms with a modern or rustic style. Overall dimensions: Height 148 cm. Lampshade dimensions: Height 18 cm. Diameter 36 cm. 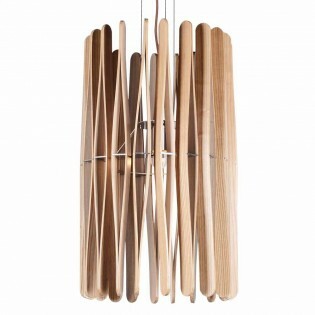 Espina ceiling lamp with conical wooden lampshade formed by different folds. The light appears shyly in it, composing a warm and welcoming light effect. Brown textile cable. Ideal for a modern or rustic style dining room. Overall dimensions: Height 157 cm. Lampshade dimensions: Height 37 cm. Diameter 45 cm. Iría ceiling light. 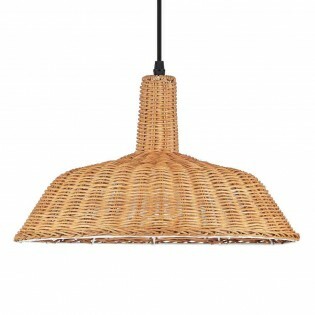 Manufactured in white wicker, a rustic material for an innovative lamp. The light will be easily transmitted producing a soft and beautiful light effect. 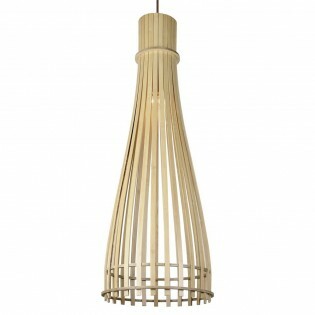 Elongated lampshade, ideal for use as the main light in a small living room, kitchen or bedroom. Overall dimensions: Height 165 cm. Lampshade dimensions: Height 45 cm. Diameter 37 cm. Jade Ceiling Lamp. Easy and simple decorative hanging lamp made by Barcelona designers, finished in ivory fibre, reminiscent of a ball of cotton candy. Very elegant and gentle, will decorate with chic your living room or bedroom. Overall dimensions: Height 170 cm. Lampshade dimensions: Diameter 50 cm. Ceiling lamp with elongated tube-shaped lampshade. Original design made of wood, will enchant lovers of rustic style. Ideal also for modern rooms. For kitchens, living rooms, dining rooms.... Put them in series and get great light effects. Overall dimensions: Height 215 cm. Lampshade dimensions: Height 95 cm. Diameter 32 cm. 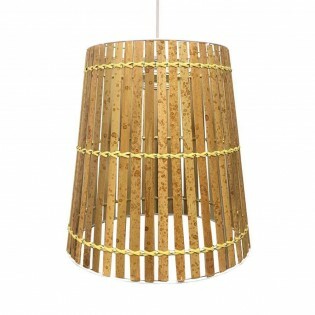 Ula ceiling lamp made of natural bamboo, a material that brings rustic style to the design. String decorations all around. A very cosy light effect is achieved. Ideal to illuminate living rooms, dining rooms, kitchens, bedrooms... Overall dimensions: Height 148 cm. Lampshade dimensions: Height 28 cm. Diameter 26 cm. Flexo with articulated structure to direct the lighting as needed. The combination of materials is extraordinary. Cement on the base, wood on the frame and metal on the lampshade. An ideal design for a bedroom as a desk light, or in the living room where it will stand out as a decorative element of great beauty. Dimensions: Height 70 cm. Diameter 23 cm. 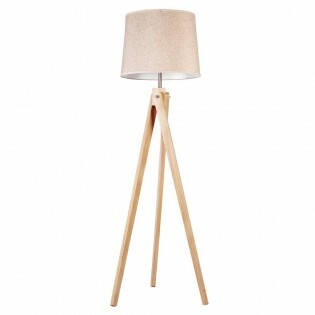 Maple floor lamp, beige tones in its structure and lampshade. Stylish design, with three supporting elements that give it personality. Manufactured in wood. 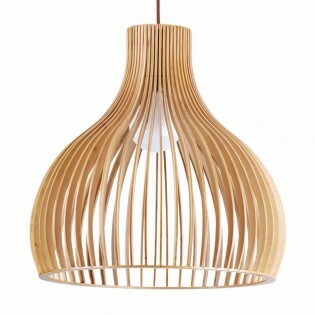 Its more classic lampshade, allows a great contrast with the wood, made of fabric. With light, it ends up being the great protagonist of the lamp. Dimensions: Height 170 cm. Diameter 45 cm. Corina floor lamp to place in the living room or dining room next to the sofa for an ideal ambient light in your afternoons of rest. 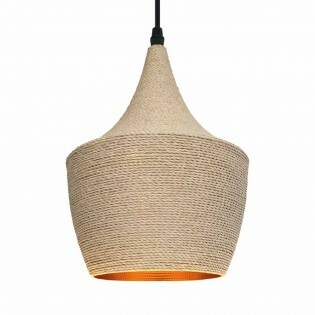 Wooden main part with decorative cord and white textile lampshade. It will fit into modern style decorations or with a rustic touch. Dimensions: Height 155 cm. Diameter 30 cm. Floor lamp Fedra with cross base and lampshade that you can move up and down to get different types of lighting. Manufactured in ash wood, white metal and iron fabric. Get a magical ambient light in your living room, dining room or bedroom. Dimensions: Height 167 cm. Length 60 cm. Width 38 cm. 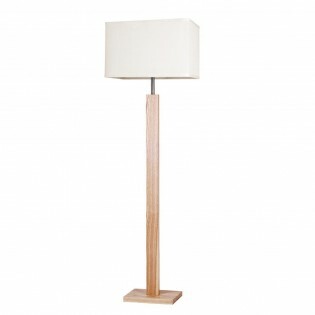 Rustic-style floor lamp with a careful design down to the smallest detail, made of wood and slightly curved body. Adjust the length as needed by moving the top of the lamp. You'll get different types of lighting. Ideal as a base for living room, dining room or bedroom. Dimensions: Height 128 - 163 cm. Width 100 cm. Diameter 38 cm. Almez ceiling light. 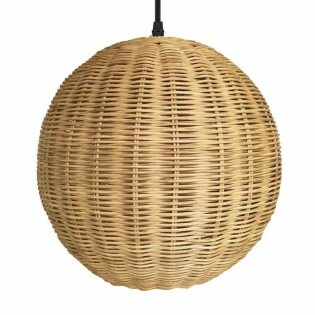 Wickerwork with a beige shade that will match modern or rustic decorations. Black fabric cable. You'll love the way the light fades through it. Ideal for a small gallery, dining room or living room. They will acquire a unique and different style. Overall dimensions: Height 157 cm. Lampshade dimensions: Height 27 cm. Diameter 47 cm. Amur Hanging Lamp. 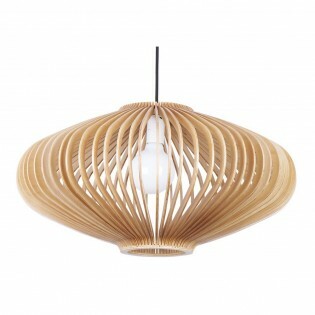 Barcelona Design, inspired by nature pendant light, with a beech wood lampshade, clear cable and wood ceiling cover. For interiors inspired by Nature, in eco friendly style. Overall dimensions: Height 139 cm. Lampshade dimensions: Height 19 cm. Diameter 30 cm. 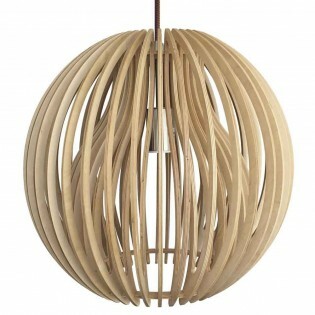 Hanging lamp with spherical lampshade, made of natural wood and brown textile cable. A unique lamp to give a rustic/industrial touch to your dining room or living room. The light will be projected in a soft way to create calm and relaxing environments. Overall dimensions: Height 158 cm. Lampshade dimensions: Height 38 cm. Diameter 40 cm. 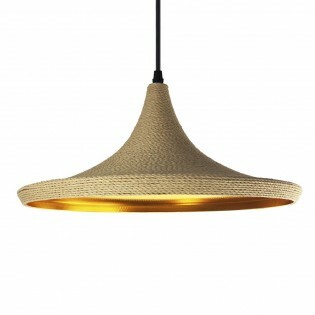 Ceiba hanging lamp with black cable and hemp flat lampshade to give the natural and differentiating touch. Orange lampshade interior. 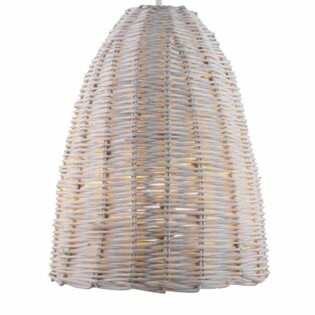 Ideal for lighting kitchens, living rooms or bedrooms in a modern or rustic style. Overall dimensions: Height 148 cm. Lampshade dimensions: Height 18 cm. Diameter 36 cm. 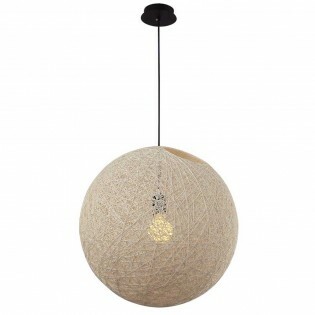 Hanging lamp for rooms such as dining room, living room or bedroom. Oval design made up of semicircumferences made of wood. Brown fabric cable. Give a different touch to your bedroom or kitchen, you will get a modern style with a rustic touch. Overall dimensions: Height 137 cm. Lampshade dimensions: Height 17 cm. Diameter 29 cm. Laurel hanging lamp. 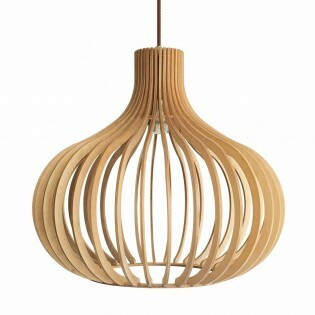 Barcelona Design pendant light, inspired by Nature with wooden lampshade in the shape of a bell. Available in brown and black textile, with a wood ceiling cover. It is proper especially for restaurants and hotels lighting projects. Overall dimensions: Height 165 cm. Lampshade dimensions: Height 45 cm. Diameter 25 cm. 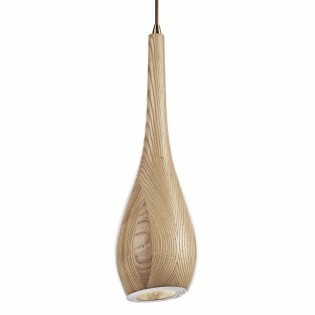 Ceiling lamp from the collection Lilo with wooden lampshade, oval design for decorative light in modern or rustic style spaces, such as dining room, living room, kitchen...Cloth cable and lamp holder in chrome finish. Overall dimensions: Height 135 cm. Lampshade dimensions: Height 15 cm. Diameter 22 cm. Hanging lamp with oval lampshade. Grille design where the light bulb acquires great prominence, projecting a soft and welcoming light. Fabric cable in the same colour. 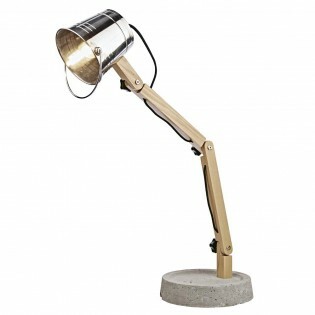 A simple lamp to illuminate dining rooms, living rooms or bedrooms in a modern or rustic style. Overall dimensions: Height 140 cm. Lampshade dimensions: Height 20 cm. Diameter 33 cm. Milo Pendat Light. 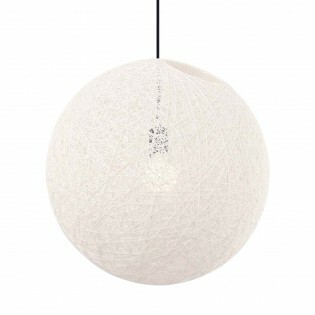 An air decorative hanging lamp made by Barcelona designers, finished in ivory fibre, reminiscent of a ball of cotton candy. Very elegant and gentle, will decorate with chic your living room or bedroom. Overall dimensions: Height 160 cm. Lampshade dimensions: Diameter 40 cm. 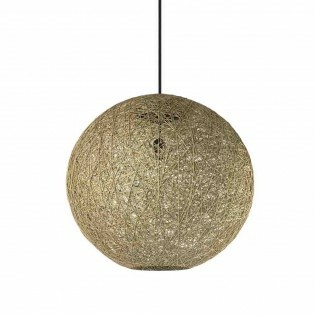 Hanging lamp from the collection Olmo for rustic style rooms. Light up your small terrace or living room with charm. It is made of ash wood with brown cloth cable. The light passes through the small grilles of the lampshade to obtain a welcoming illumination. Overall dimensions: Height 142 cm. Lampshade dimensions: Height 22 cm. Diameter 22 cm. 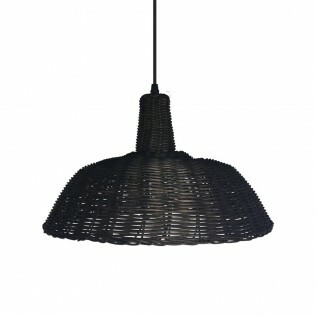 Ceiling lamp with black cloth cable and flat lampshade made of a very rustic material. Wicker and black finish. The kitchen, living room or gallery are ideal rooms to place it. You will get a modern atmosphere full of freshness. Overall dimensions: Height 143 cm. Lampshade dimensions: Height 23 cm. Diameter 38 cm.